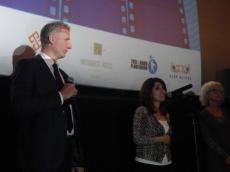 The traditional 8th European Film Festival solemnly opened in Park Cinema Park Bulvar on November 2. The event, organized jointly by The Delegation of the European Union to Azerbaijan, the Embassies of the EU Member States and Norway, in cooperation with Park Cinema will last until November 12. Representatives of diplomatic missions, art and cultural figures, cinema lovers attended the festival's opening ceremony, Trend Life reported. In his speech, Head of the EU Delegation to Azerbaijan Kestutis Jankauskas stressed that film festival, which became a tradition in Azerbaijan, serves the development of cultural relations between EU countries and Azerbaijan. The programme includes screening of 21 films from 19 European Union countries (Belgium, Bulgaria, Czech Republic, Croatia, Estonia, Finland, France, Germany, Hungary, Italy, Latvia, Lithuania, the Netherlands, Poland, Portugal, Romania, Spain, Sweden, the United Kingdom) as well as Norway and Azerbaijan. The films represent various genres to suit interests of the possibly larger audience. During the festival opening ceremony, films "Lumière!" (France) and "Monkey" (Bulgaria) were presented to the viewers. The film "Lumière!" by French director Thierry Frémaux a unique journey to the origins of cinematography, a story the Lumiere brothers. The film is based on archival materials. The drama "Monkey" directed by Dimitar Kotsev tells about the life of two teenagers. They will find answers to questions that adults do not even dare ask. In the framework of the festival, Azerbaijani film "Pomegranate Orchard" will be screened in Park Cinema Metropark on November 8. Notably, films screening is being held in Park Cinema Metropark, Park Cinema Flame Towers and Park Cinema Park Bulvar. Films are shown in the original language with English subtitles. All events are open to the public and organized free of charge on "first come first served" basis.